It's been another bad week for Sears stock. Today (Thursday) Credit Suisse analyst Gary Balter called for Sears Holdings Corp. (Nasdaq: SHLD) to liquidate its assets, saying in a note to investors that recent events surrounding the struggling retailer have him singing "This is the end" (a nod to The Doors' song). "Unless it sells off real assets while somehow maintaining the cash flow from those assets, this story is not likely to have a happy ending, and that ending continues to depend on suppliers," Balter wrote. Sears shares fell 5.28% Thursday on the news. 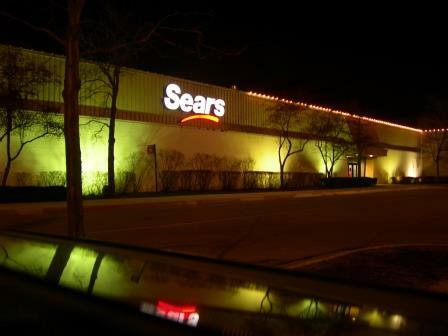 But the current round of trouble for Sears began earlier this week. Sears stock fell 9.4% Tuesday and shed another 2.6% Wednesday on news that the company is borrowing $400 million from ESL Investments, the hedge fund owned by Sears Chief Executive Officer Edward Lampert. "It's an easy deal for him to do" because it is short term and secured, Mary Ross Gilbert, an analyst at Imperial Capital LLC, told Bloomberg. "It's no surprise because we already know that the company has significant cash burn." The ESL Investments loan is a much needed lifeline and will provide "additional financial flexibility" as the company enters the crucial holiday shopping season. But it might be little more than a Band-Aid for the ailing retailer. Sears has been selling and spinning off assets to raise cash amid escalating losses. Last month, the limping retailer reported its ninth consecutive quarterly loss on a continuing slump in sales. That sparked fresh concerns about the future of the legendary company, once the go-to store for American shoppers. The struggling multinational merchant, which runs Sears and Kmart stores, reported a hefty loss of $5.39 per share, or $573 million, for the period ended Aug. 2. That compares with a loss of $1.83 a share, or $194 million, in the same period a year ago. Revenue fell 9.7% to $8 billion from $8.87 billion, reflecting the impact of a burst of store closures and the separation of its Lands' End Inc. (Nasdaq: LE) clothing business in April. As of Aug. 2, Sears' U.S. store tally was trimmed to 2,302, of which 1,077 were Kmarts. In addition to the 130 store closures already announced, Sears said it's considering closing more stores this year. Sears has shuttered more than 300 stores since 2010, with 166 of those closures occurring over the last 12 months. Analysts did not mince words about what the most recent earnings miss means for Sears and Sears stock.